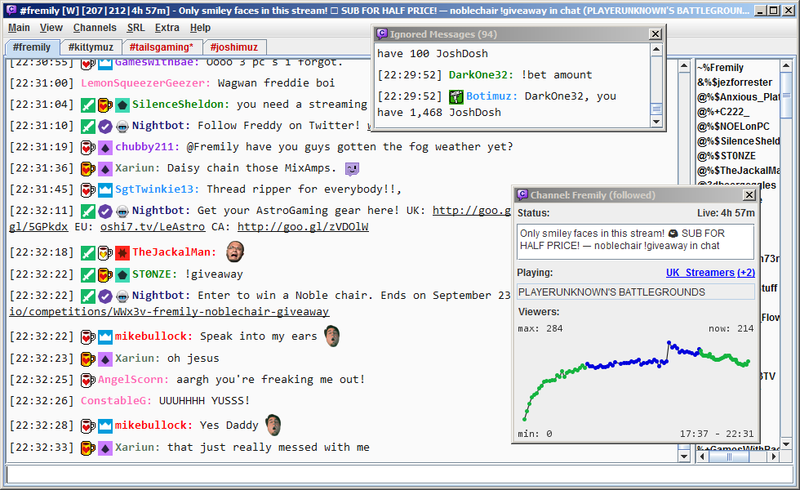 Chatty is a Twitch chat client for everyone who appreciates a dedicated desktop application (similiar to a classic IRC client), but doesn't want to miss out on Twitch-specific features. When you start Chatty the Connect Dialog should come up. Click Create login.. and Request login data and follow the instructions to authorize Chatty to connect to chat for you. Windows: Dragging the upper edge to maximize the window vertically doesn't resize the contents of the window. This may be a Java Bug that I cannot fix. Workaround: Try double-clicking the upper edge instead of dragging it. 930 2,485 chatty <img src="http://www.oldergeeks.com/downloads/gallery/thumbs/chatty1_th.png"border="0"> Jan 26, 2018 - 11:52 0.9 70.03MB ZIP , out of 11 Votes.